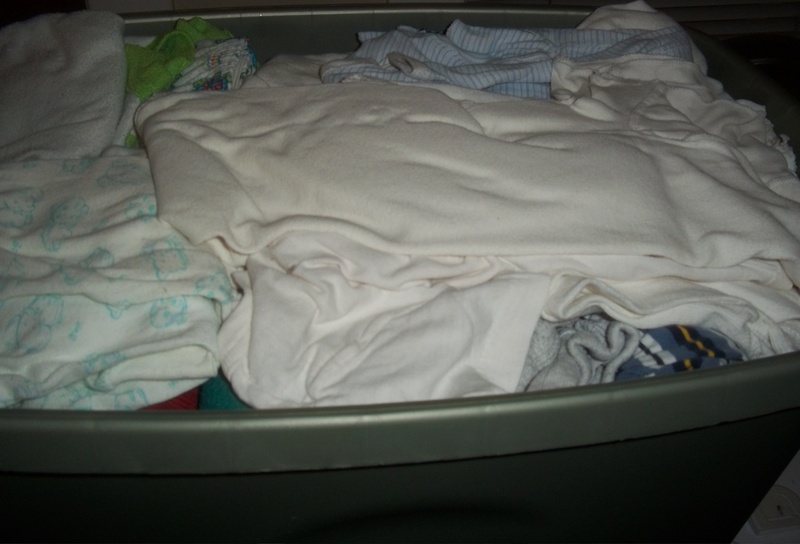 My husband brought up a tub of clothes from the basement marked 2 to 4T. I had packed these away after our son outgrew them thinking that a girl could wear them. Now that we have two little girls, I don’t know what I was thinking! One of the outfits was a light blue and dark blue striped romper covered with basketballs. My youngest could wear this, but then everyone would think she was a boy. Except for the bodysuits, almost all of this 10 quart tub went in the garage sale pile–43 items total. Our grand total is now 1,288 items out of our house in 23 weeks! You may have noticed I haven’t been decluttering as much as I used to. That is because I have moved from decluttering personal items to decluttering my eBay business in the last few weeks. For the eBay business, I have taken 6 bags to Once Upon a Child with a retail value of nearly $3,000 (and only gotten a pittance back, but at this point I am just happy to have the items off my hands). I would love to close my store soon and have all of the items out of our study by the end of July. I am delighted to finally uncover this room again. Have you been decluttering? If so, tell us about your progress in the comments. It sounds like your definitely getting rid of a bunch of stuff, and that’s great! My husband is really good at not keeping things we don’t need. We recently sold a bunch of “garage” items that we no longer needed, like a wet/dry vac. Since we don’t live in a house any longer, we no longer needed such an item. It’s great to clean out our storage – the less there is, the less space we need. Yes, your husband and I have alot in common. 🙂 I am enjoying getting rid of so much.